Rawley is using Smore newsletters to spread the word online. 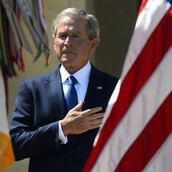 1st accomplishment: There were no more successful attacks on U.S. soil after the attacks of 9/11 while Bush was president. 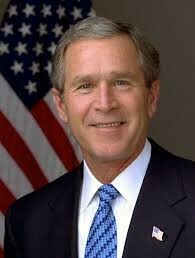 2nd accomplishment: 4th Republican president in American history to serve 2 terms. Quote: Terrorist attacks can shake the foundations of our biggest buildings, but they cannot touch the foundation of America. These acts shatter steel, but they cannot dent the steel of American resolve. -George W. Bush on the night of 9/11. 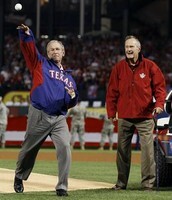 Bush throws out the first pitch of Game 4 of the 2010 World Series in Arlington, TX. 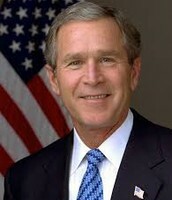 President from 2001 to 2009. 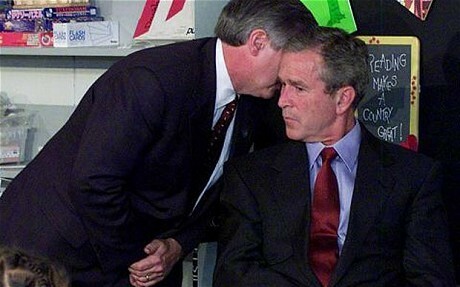 Bush being told about 9/11 attacks. On the date of 9/11 George W. Bush was reading to his daughters class when 2 planes were hijacked and flew into the World Trade Center Towers in New York.